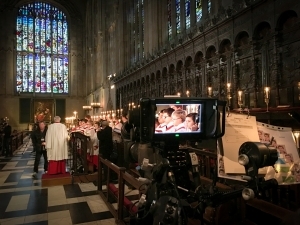 The BBC filming in King’s College Chapel for Carols from King’s on a previous year. The famous Christmas Eve television broadcast, Carols from King’s, will this year be made available as a download immediately following the broadcast on BBC Two. It will join previous DVD releases of the programme, including the 60th Anniversary Edition, which was made available by King’s in 2014 on DVD. The 2017 download is now available for pre-order. While UK licence-fee payers are able to watch the broadcast on BBC iPlayer for up to 30 days following the broadcast, this download will be available to everyone around the world. As with all of the recordings on the King’s College label, proceeds from the download will be reinvested in the Choir and music-making at King’s. This year’s broadcast will feature traditional favourites Sussex Carol (arr. Ledger) and Away in a Manger (arr. Willcocks), as well as an arrangement of O Holy Night by John Rutter and O Magnum Mysterium (Lauridsen). Readings from the King’s James Bible and poems by Christina Rossetti and Christopher Pilling will intersperse the carols and hymns sung by the choir and congregation. To pre-order the video download, see Carols from King’s (2017).